Our coverage of interactive experiences that heavily prioritize narrative over gameplay. For many years adventure games were believed to be a niche genre, barely hanging on with life support and enjoyed only by a handful of crazy Germans. Here at Adventure Gamers we always knew this wasn’t the case, but more recently the rest of the world seems to have caught on too. (Yay!) As adventure and adventure-ish games resurge in popularity thanks to a parade of high-profile releases, crowdfunding, and booming indie development, another niche is quietly emerging: narrative games with almost no “game” to be found, with no higher goal than to tell a story. Some people insist on calling such games “walking simulators.” I hate that term. First and foremost because it’s a veiled insult coined by the same people who were cheering over the so-called death of adventure games to begin with, but also because it’s grossly misleading. Think about it: a literal “walking simulator” would involve lacing up tennis shoes and strolling around the block, earning points for the number of steps you take. Okay, we’ll call them “interactive stories,” then—but is that any better? Is it even accurate? Take Fragments of Him and Virginia, two recent releases that seem very different on the surface. Yet they actually have a lot in common: both are self-consciously artsy productions made by tiny indie teams. Both promise emotional stories with the potential to punch you in the gut. Both feature ordinary, real-world people living ordinary, real-world lives. And both focus on narrative at the total expense of anything resembling puzzles or gameplay—in fact, though they’re technically “interactive stories,” interactivity is at a bare minimum in each. 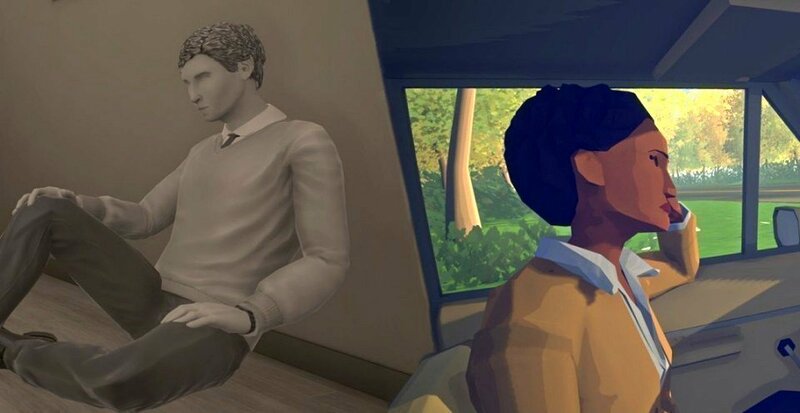 Fragments of Him, by Dutch developer Sassybot, is a bleak exploration of love and grief that begins with a young man named Will dying suddenly in a car crash. Told from four perspectives—Will’s, his boyfriend’s, his ex-girlfriend’s, and his grandmother’s—Fragments of Him allows us to peek in on the life that has been lost and the mourning process of each of these people who loved him. (Uplifting stuff!) As these characters convey their memories of Will and the depth of their grief, your role is to hover near them, take in their surroundings, and hear them out. Virginia, by British studio Variable State, presents itself as a Twin Peaks-inspired mystery, but that setup turns out to be a red herring. Recent FBI inductee Anne Tarver and her partner, Maria Halperin—both women of color—are investigating a small town teenager’s disappearance. But Anne is also investigating Maria, under orders from their (old, white, male) supervisor. As Anne and Maria progress through the weeklong case, Virginia’s dream-like, heavily symbolic story veers off in a different direction to explore issues of loyalty, friendship, responsibility, patriarchy, and the far-reaching consequences of poor decisions. Even in 2016, a bisexual man and a black woman are unusual video game heroes, but these aren’t unusual people. They live in real-world places you could reasonably go, in time periods you likely remember. (Fragments of Him takes place sometime between the 1990s and now, while Virginia is set in 1992.) You may never have visited London or the town of Kingdom, Virginia, but you’ll still be able to relate to these characters. Even if you’re not a minority woman struggling for acceptance in a male-dominated field or a man who has deeply loved both a man and a woman, Virginia and Fragments of Him will make you feel like you could be. It’s helpful that the protagonists are relatable, because both games have experimental presentations that risk being off-putting. At first glance Virginia’s vibrant, stylized graphics seem inviting, but that supposition is shattered by a total lack of speech. You heard me: this is a two-hour story game without any words. Its wonderful orchestral soundtrack picks up much of the slack, skillfully conveying the tone, tempo, and tenor of on-screen events, while the characters’ gestures and simple yet expressive faces portray a good deal of emotion even without dialogue. Still, asking players to muddle through two hours of uncertainty is a big ask, and keeping up isn’t always easy in a game often abstracted by dream sequences and jump cuts. One second you’ll be walking down a well-lit hallway; the next you’re descending a concrete staircase. The jump almost seems like a bug. We’re used to such visual tricks in movies, but in a game where you’re controlling the protagonist’s forward momentum (or at least have the illusion of control), the jump from one place to another is jarring. All of this unfortunately adds up to an experience that’s more about keeping a grip on the plot than about losing yourself in its poetry. On the other end of the spectrum, Fragments of Him is so devoid of color it’s practically sepia. Its protagonists are like mannequins with facial features barely hinted at, while secondary characters are shadowy figures with no features at all. The aesthetic certainly channels its characters’ emptiness and grief, and the game’s world exhibits impressive attention to detail, but it’s hard to get jazzed up about an experience that’s so obviously going to be a downer. It’s also a wordy affair, dominated by the interior monologues of its four characters. The 2½ hour experience has only one interactive dialogue; the rest is narration. This can get dull, especially since points tend to be repeated just in case you missed them the first or second time. The story never confused me, as Virginia’s too often did, but I’m sorry to say it never surprised me, either.